In the municipality of Alozaina, as well as in other municipalities in the Sierra de las Nieves, all the festivities have a popular origin, recovering traditions that sometimes reach until the conquest and the establishment of the Christians brought down from the north of the peninsula to repopulate the municipality. The work, in the majority of the cases, is done without seeking or baring in mind any personal profits. The 150th anniversary of Alozaina’s music band is just round the corner, and this has been possible thanks to a group of people that have taken particular interest to conserve this tradition that has existed since 1864. Held on the last weekend of February and is one of the oldest customs in the municipality. The locals, as well as dressing up, organise competitions and fill the whole neighbourhood with flour. This curious festivity dates back to ancient times when the young lads would throw flour on the young ladies as a way to find “girlfriends” and they would use flour because back in those days it was forbidden to touch a girl until they were a proper couple and married...so they used this flour as a protective layer so that they wouldn’t touch their skin. Today, the boy throws the flour over the girl, and if they like each other, they both throw flour over their friends. Alozaina was one of the first municipalities to introduce a woman as a throne carrier. The music band catch special attention as they are the oldest band in the province. The altars are decorated and the locals collect aromatic plants and flowers to make the procession more beautiful. 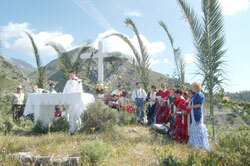 The first Sunday of every May is Jorox day, the romeria (pilgrimage), moment in which the mirror and crystal Cross, decorated with flowers, is taken by carriage to Jorox. After the mass held in the countryside, the locals (pilgrims) enjoy their day out in this countryside with food, drinks and traditional dances, the Jorox fandangos. Alozaina holds a cultural week, generally during the month of June and offers a wide variety of activities. For example, one year, they paid tribute to the town’s music band, while another year they also paid tribute to Maria Sagredo who fought against the Arabs defending the conquered city. During the cultural week in Alozaina, the village locals dress up in medieval costumes, with ambience music from back in those days, they set up stands and light the place up with torches. This activity intends to be a tourist attraction in itself every year. Many other inland villages in Malaga province hold very similar festivities as well and that remind us of the origin of these municipalities, transporting us to the past with the flavours we can taste and the smell of incense and aromatic plants. Held around the 25th and 26th of July and during the days that the fair is on, they organise sporting competitions, contests, concerts and with the music of Alozaina’s music band. Local festivity in honour of the olive, the main cultivation in this town. In the Constitution square they offer tastings of the olive harvest and they give out a prize to the Olive Queen, a tribute to the woman’s role in the collection and elaboration of the olives. As one can see, there are so many cultural events to enjoy in Alozaina, each and every inland spot in the province of Malaga has something special to offer and show us. Alozaina has many attractions that simple have to be visited.